Is a surgery that is performed through a single port – or incision – in a patient’s navel (belly button). 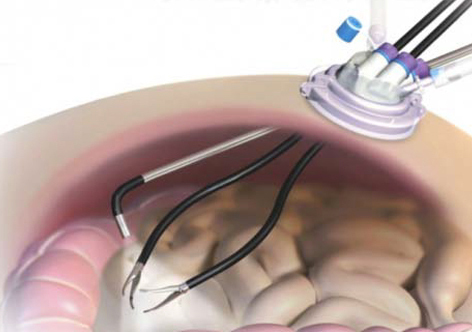 Single Port Surgery is a form of minimally invasive – laparoscopic – surgery. In traditional laparoscopic surgery a telescopic rod connected to a video camera, or laparoscope, is inserted through a small incision in the abdomen. Three to five additional small incisions are made and used as “ports” in which to insert instruments to remove a kidney, for example, or to repair the urinary tract. Because laparoscopic surgery usually results in fewer complications and a more rapid recovery, patients often can return home the same day. For Dr. Pateros, the single-port approach is more challenging than traditional laparoscopy because Dr. Patero has less freedom of movement with all instruments using the same entry point. Specially designed flexible instruments help to overcome that limitation.